Education activist Angeline Murimirwa was given the "Diamond Ball Honors Award" by Rihanna's Clara Lionel Foundation. The problem was not her grades. It was money. Her parents worked odd jobs to support the family. And sometimes there wasn't enough cash for school fees. Now 38, Murimirwa did manage to complete her schooling and has gone on to become the executive director, Africa, of Camfed (which stands for the Campaign for Female Education). It's the charity that gave her a scholarship to stay in school and it currently supports nearly half a million secondary school students in Ghana, Malawi, Tanzania, Zambia and Zimbabwe. She's also the mother of four and -- in an ironic twist -- still a few credits shy of her university degree (she laughs about her procrastination at completing the final bits of coursework). 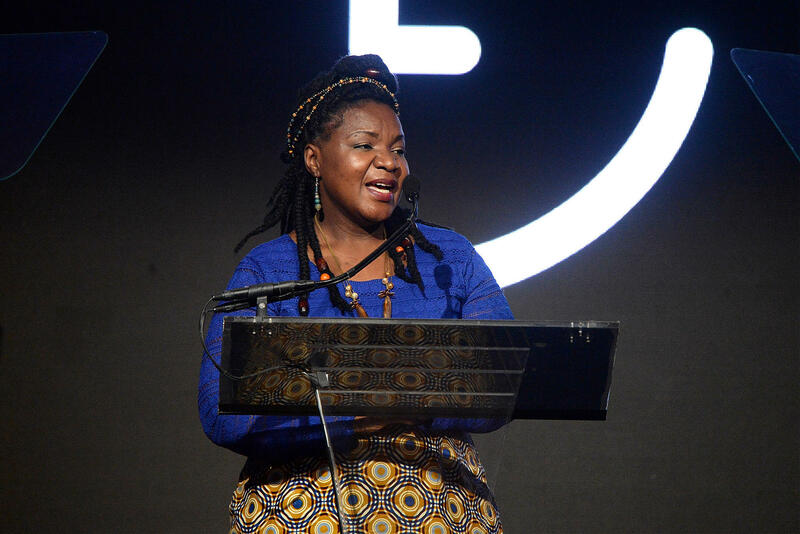 I spoke with Murimirwa when she attended the Skoll World Forum in Oxford, England, this year. We met up at a local pub, where she sat at a table behind paintings of bewigged British barristers. Her own coiffure was a crown of braids. Before we start the interview, she gives a grin and says, "I'm going to go African on you" -- and calls out to a colleague from Camfed who's across the room to come join us. "What does that mean, go African?" I ask. "In Africa, you always shout, 'Come here!" she says and laughs. And we start talking. This interview has been edited for length and clarity. How much did school cost when you were in primary school? Education was free but there were still some costs — a couple of exercise books and a pencil — but quite minimal. How did your parents raise the money for the fees? My parents did piecework, field weeding. What happened if they fell short? At school, a visitor would come and call out your name and say you need to leave the classroom until you can get the money. My teacher knew how poor I was, and I think I was the favorite child. When the visitor would come, the teacher would say, "Angie, I think you need to go to the bathroom." It was just a pit. I would wait there until the visitor left. That's how I played the system. And you made it through the seventh grade and took exams for secondary school. How did you do? I made straight 1s – As – the best you can make. I was crying, really weeping. It was a relief for me to have passed, but I knew I could not go to secondary school. You need books for nine subjects and you need notebooks and uniforms. I could work doing piece jobs [to earn the fees] but there was no way I could work and go to school. And in an awful way, it was your destiny to drop out. My grandmother dropped out in grade 5. My mother in grade 6. The teacher who taught me in grade 6 is the same teacher who had taught my mom. My mom was intelligent. The teacher said, 'It would really be a tragedy if you ended up where your mother ended." Are daughters more likely to end their schooling earlier than sons? Really, it's a cruel decision for most families in Africa. You may have to go 20 kilometers to school and back. There are huge security concerns for girls. It's slightly safer for boys [to make that commute]. It's a very economic decision [since a boy with an education may have better job prospects than a girl]. It has nothing to do with favoring boys over girls. And then you had an eleventh hour rescue? The school told me about Camfed. I qualified for support. Everyone in my village was skeptical -- they said, "They want to put you in slave trade or something." I'll be honest, I was so relieved I was going to get the support I needed. Camfed provides school fees and the school uniform and everything you need to buy -- soaps, toothbrush, blankets. It was for a boarding school in Zimbabwe. How did you feel when you started school? I was constantly crying instead of sleeping. I'd come to the dining area and wonder if my mom and dad and sisters and brothers, did they eat today? How did you get over those feelings? One teacher said, "I see students. I don't care who your mother or father is." The best thing was what he said next. At the school, June was very cold. Sometimes in June water froze into icicles. He said, "I want you to know there are four Junes that will be very cold. You have to learn when you're very cold. You are going to go through four Junes [at school] to make your life better. And then you can go back to your village and transform the lives of your family. You are the person who can rescue them." So that idea of enduring four cold Junes gave you the strength to go on? I was lonely, and I missed home. I was struggling with it all and doubted if it was all worth it, worth the sacrifice. He gave me a purpose and hope. What's a typical day like for you at Camfed? I work not less than 10 hours each day! I oversee our work across five countries and 5,745 schools. I work with the schools, the chiefs, the communities, the district education officials -- and [I work] to bring financial support to our policies. It must be frustrating that 20 years later, there are still so many girls whose families can't afford to pay their school fees. Yes, I get frustrated but I have no pity party. It reminds me why this matters. How do your parents feel about the way things turned out? My father passed away but he was so proud that I could take care of him. My mother, to be honest, even years later, I think she can't believe it. Everything she wished would happen to her -- happened to me.